SABR sells and distributes Loftware Connector for Oracle, for Barcode Label printing and RFID encoding integration to Oracle-Based Applications. The Loftware Connector for Oracle establishes a high-speed 'connectivity bridge' between between Oracle-Based Applications and the Loftware Print Server®. The combination of Loftware Connector for Oracle and Loftware Print Server enables Oracle-Based applications to generate labels across large networks of printers and empowers companies to comply with current and future barcode label and RFID specifications. 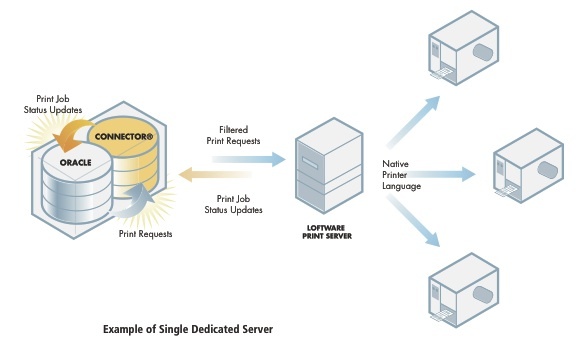 The Loftware Connector for Oracle, working with the Loftware Print Server (or multiple Loftware Print Servers), sends the right label with the right data to the right printer at the right time. This combination enables Oracle-Based Applications to generate labels across large networks of printers. With a High throughput system, this speeds the processing of label print requests via its 'High Speed' Queuing System to support label printing on a 'large to massive' scale, ranging from 100's to 1000's of printers. Label print requests can be triggered via any defined Business Flow or Transaction within Oracle WMS or Oracle MSCA such as 'Receipt', 'Ship Confirm', 'Pick Load', etc. Label requests can also be triggered via stored procedures, database triggers, or a PL/SQL call from any Oracle-Based Application. From a single Label Print Request, the Loftware Connector for Oracle enables you to print multiple label formats, use multiple printer types, and automatically determine which label or labels to print and where to print them. The Loftware Connector for Oracle installs directly into the Oracle Database (in its own schema) as a stored procedure through Oracle's 'Synchronous Mode' application program interface (API). This integration is seamless with no programming effort required. The Loftware Connector for Oracle sets up all labels with associated data elements and target devices using the configuration program in Oracle Warehouse Management Systems (WMS) and Oracle Mobile Supply Chain Applications (MSCA). It also automatically updates the Oracle WMS label printing interface for printing via the Loftware Connector for Oracle (Oracle MSCA does not have a separate setup but uses Oracle WMS profiles for Label Print Mode). The Loftware Connector for Oracle is readily configurable to support any Oracle-Based Application. A setup routine creates all the required database objects in the Oracle database to operate and administer the Loftware Connector for Oracle in the PL/SQL environment. In addition, related files, sample code, and documentation are installed. Configuring the Loftware Connector for Oracle is made easy through the Loftware Connector Console, a browser-based application that is installed separately and serves as the menu-driven interface to all of the Loftware Connector for Oracle settings. Improved Business Logic – Users now have more business logic options when using filters. Expanded filtering capabilities allow you to order and chain filters, enable and disable filters without deleting them, and trigger a filter based on incoming variable data. Updated Administrator Console – A new look and feel brings expanded administrator capabilities.